Use these copper crimps for securing the Gull Wire around each post and spring. 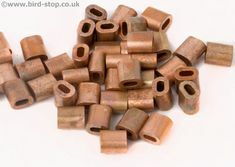 Copper crimps will only work with 1mm gull wire, please purchase nickle crimps for use with pigeon wire. The ideal Seagull Deterrent and very reasonably priced.